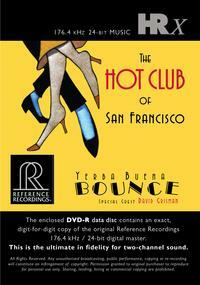 With Yerba Buena Bounce, its tenth CD, The Hot Club of San Francisco confirms its reputation as America's longest-running and finest Gypsy Jazz ensemble. Inspired explorations of Django Reinhardt's tunes, originals and more, are captured in shimmering HDCD sound. The Hot Club of San Francisco is a quintet of accomplished and versatile musicians who celebrate Django Reinhardt's and Stephane Grappelli's renowned Hot Club de France. The ensemble borrows the all-string instrumentation of three guitars, violin and bass from the original Hot Club but breathes new life into the music with innovative arrangements of classic tunes and original compositions from the group's superb lead guitarist, Paul Mehling. Hearing the ensemble takes the listener back to the 1930s and to the small, smoky jazz clubs of Paris. Mandolinist David Grisman, father of Dawg music and good friend of The Hot Club, makes a special guest appearance on two tracks. The set is further enhanced by bandoneon virtuoso Seth Asarno. Two bonus tracks feature the quintet augmented by three Dixieland horns.